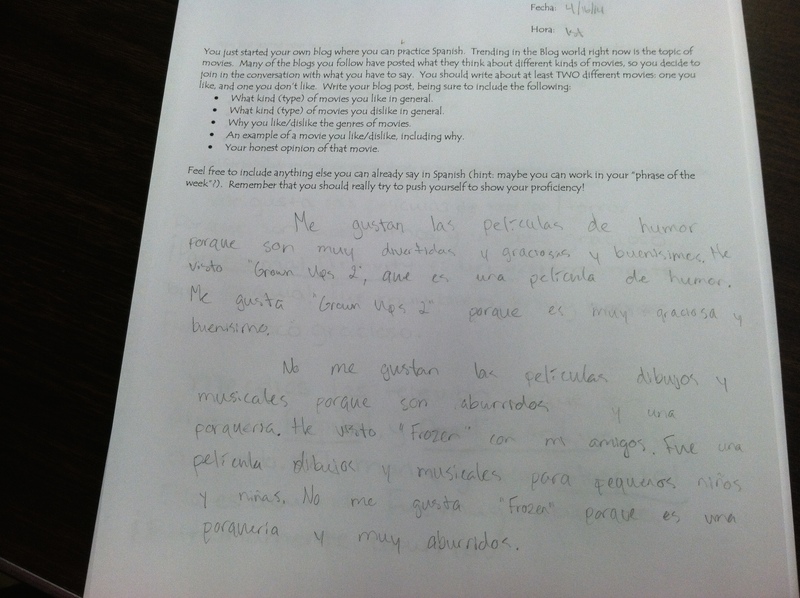 In our first week back from Spring Break my Spanish II class has been working on a unit about watching movies. I got the ideas from Sra. Drew and this post, and adapted them for my students. Anyway, I am prefacing my success with errors. I started on Monday by giving a vocabulary sheet and simply doing PQA with the sheet. Since there were quite a few cognates and I was able to point to the words/phrases if students needed to it, this went pretty well. I definitely need to learn more how to facilitate PQA sessions, though, as I feel like I run out of things to ask without getting boring, and this happens pretty quickly. I only have 16 students this hour, so I am able to ask each student a different question of two, but I feel like I do need to learn to do a better job of this. So Day 1 (Monday– first day back from Spring Break) consisted of PQA with this vocabulary, and a reading activity (similar to Sra. Drew’s post). This went quite well and I felt good about it. At end the hour (I told you, I go pretty quick, unfortunately. I need to learn to SLOW DOWN), I modeled how to write a few sentences about movies we like, giving examples of a particular movie. For homework they had to write another mini-paragraph like this on their own. On Day 2, we practiced writing again in the same manner. I walked around as they wrote and I was able to give 1-1 feedback to each student as they worked. I also incorporated pop-up grammar when I saw common errors. We really tried to push the writing and get more and more detail, which resulted in each student writing two full paragraphs during class. Towards the end of the hour, we partnered up, switched papers to peer edit (modeled), and each student wrote a response to the paper the read. Students seemed to feel more confident after this. This was, admittedly, the best response, but each person in the class met my proficiency goal! Yay! I was super excited to see how much and how well they wrote. This class is Spanish II, though not one person in the class had a true Spanish I (before I was hired, this school used Rosetta Stone for about a year and a half, which these guys took in middle school). So excited for your success! What’s next? Thanks again for posting your units! They have been invaluable for this transition! Without something to model from I am sure that I would be struggling! Glad to help! I’ll post this as we get there, but my remaining units for the novice class are centered around “back in the day” (lives when we were kids, imperfect), “traditions and celebrations” (transition from imperfect to preterit), and “música popular” (where we will continue to work on opinions AND use preterit to create timelines of musician’s lives). Let me know if you’d like to collaborate on any of this.